The G Watch pairs with my Android phone via Bluetooth. The battery lasts for almost two days. It works with Google Now and gives me notifications and has a few apps it’s integrated with, and has more apps on the way. The notifications are surprisingly useful and include emails, text messages, weather, # of steps (pedometer), stock prices, Facebook, etc. I can read enough of a snippet of information in a notification to be able to judge if it’s worth pulling my phone out to have a look or not. In sleep mode, the screen is black with white text and icons (pictured). That looks quite nice. It can tell when I’m looking at it and wakes up – the screen brightens and turns to color mode with more detail. Notifications show on the watch by default, but I think that can be turned off. When a notification occurs, it makes a slight vibration on my wrist. That is not annoying. When I dismiss a notification on the watch, it also dismisses on the phone. It doesn’t appear to have negative battery consequences on the phone – at least not noticeable. There are some configurations that can be made on the watch and others that are made using the companion app, Android Wear. 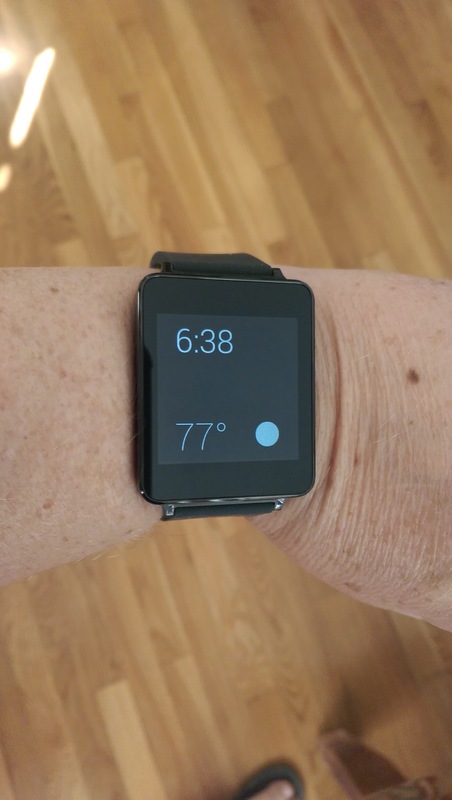 Android Wear is also used to load new apps, but I haven’t tried that yet. The Motorola watch that’s supposed to be shipped to me will have a round watch face. I’m curious to compare the two. I can send emails or text messages simply by looking at it to wake it up. Then, I say “OK Google”, and follow that with a command. The downside is it uses voice recognition and sends emails and texts immediately, giving me no chance to read and edit what I’m sending. I sent a few very illegible and humorous emails and texts to the hubby before giving up on that. I can also see where it might easily pick the wrong person to send to based on voice recognition, but I’ve been lucky on that front so far. Voice commands to view my steps for the day or start the stopwatch work really well. It’s been correct every time I tried it, and I’ve been using those two commands a lot. Asking for the current weather also works, but seems less useful, since I can look out the window or step outside to see the current weather. The big downside that I see to this watch so far is the charger that comes with it. First of all, it’s a powerful magnet (verified this by sticking it to the fridge), and it has a cautionary message not to put it near my other electronic equipment. What? I can’t stuff it in my purse??? Second, is that it comes with a sticky backside. I’m supposed to peel off the plastic cover and stick the charger permanently onto a table. Huh? I can’t travel with it? I’m not sticking it to a table and they can’t make me. Aside from that, it’s small and easy to use. I tried resetting it to stock, and that was seamless. An update was pushed out already since I’ve had it and that installed during dinner last night. It took only a couple of minutes and was seamless. I’m planning to download the SDK and make a basic flashlight app (all white screen). I know it won’t make much light, but I think it might be enough for what I use my phone for every now and then. Regardless, it will be an entertaining experiment and an opportunity to decide what I think about developing for it. Overall, I’m liking this watch and surprisingly, have actually worn it all day every day since I received it (one week so far). I’m checking my steps (convenient since my Fitbit is having issues). I’m using the timer for watering plants outside and for interval training. I’m using it to decide whether to answer the phone when it rings and whether emails and other notifications are worth pulling my phone out to check. It’s useful. If I had to go out and buy one, I probably would not, but only because of my negative bias against watches in general. Did I mention that I tried out Google Glass at I/O? That was interesting, too. I tried it with the Allthecooks app. That app is working to solve some of my own pain points; it’s as if they read my mind. (I’ve even been working off and on for the last year to design an Android app for myself to do something similar.) Please check that app out if you have a chance. I can now see into the near future, and we will all look like idiots walking around talking to ourselves and tapping on the side of our heads (glass) or talking to our wrists and tapping them (watch). Hahaha! Thanks for reading this. Maybe I’ll see you at Google I/O next year. 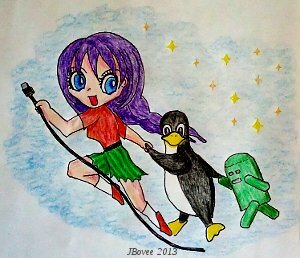 I drew an image for the blog today. It was a very high-tech project, created using colored pencils and a Sharpie on cheap paper, and photographed using my Android phone, lol.